Very Quiet & Restful! Delighted house, related stones, wood beam, fire-place, garden, SPA + terrace with mountain sight, nearly no trafic front of house, dead end. View on "Google earth", point out: Duines, 73400 Marthod. Had a lovely week with our family the apartment was great for all ages 63yrs-8months. We went skiing most days taking it in turns to say with our 8 month old granddaughter and the house was lovely a bounce having the hot tub for when we got back from skiing. I’m sure we will book again. "We stayed in this house with two kids and had wonderful time. The house has everything you need for a vacation (all appliances) and is in excellent condition. We liked having a fenced yard for the kids - they could play outside without much of our supervision. The surroundings are very peaceful, yet the house is close to main attractions of the region (Lake Annecy and Mont Blanc). The owner is a very nice and helpful person - he provided us with ideas about hiking and other activities around. We will definitely come back here!" "Being originally from the village of Marthod and living now in Ireland, I took the opportunity to bring my fiancee and her family to Savoie to visit my village. We had a lovely stay in Philippe''s house. We were blessed with the weather and the house contains all the necessary appliances, and it was spotlessly clean. Philippe was always very friendly and we would definitetly like to come back again. 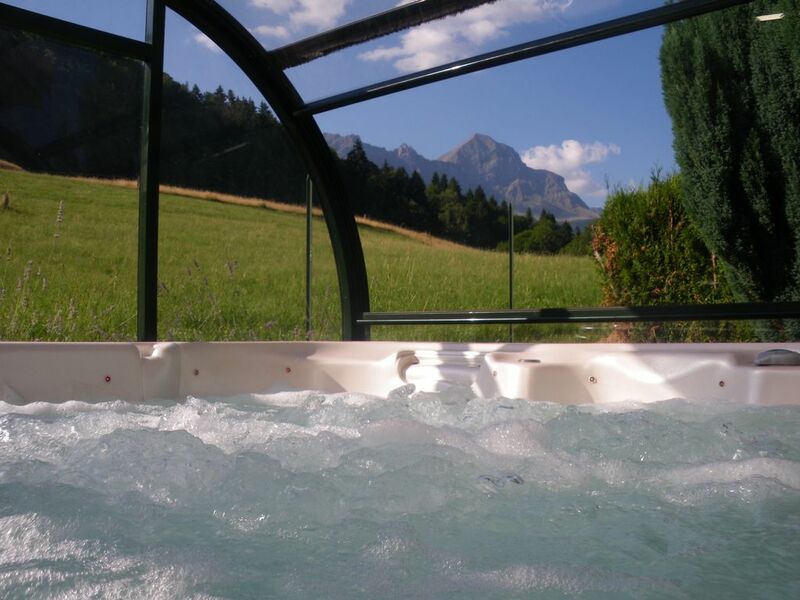 I would recommend this rental house to anyone, especially if you are looking for peace and quiet in Savoie." "Our family had a great stay at this house. It is very clean, convenient, very welll equipped including dish washer and washing machine. Big garden - perfect for children. NIce view from the house. Also, Marthod has a great location, only minutes drive from the highway. I recommend it to everyone." Maison très confortable, bien isolée, donc chaude, très bien équipée, fonctionnelle,très propre avec un grand terrain, vues magnifiques sur la montagne, calme assuré. Le summum le spa!!!! Super agréable !!!! Le propriétaire est d'une grande gentillesse. Il nous a réservé un super accueil, il est très prévoyant, c'est bien la première fois qu' on nous a accueilli aussi chaleureusement en 30 ans de location. Bref que du bonheur, nous sommes retournés chez nous avec plein de merveilleux souvenirs et comptons bien renouveler l'opération. This is the 2nd time we have been to this beautiful house, with gorgeous views, it is the perfect place to relax and unwind. So many things to do within easy reach and the house has everything you could possibly need. The garden is perfect and the hot-tub is a great bonus. I can’t rate it highly enough and our host Philippe was great also. tenant really nice and respectful. I should enjoy they come again ! Highway A430 untill Albertville N212. Direction Annecy/Ugine; way out n°2 Marthod. Climb during 5km until Duines, dead end. Train station at Albertville(7km from house). near Ski station: Crest-Voland(16km), Les Saisies, Ntre Dame Bellecombe(17km), Flumet(15km), Praz/Arly(17km). In the center of: four valleys(Beaufortain, Tarentaise, Val d'Arly, Combe de Savoie); three mountain massif(Bauges, Beaufortain, Aravis). SUMMER: Very good situation for all activities, sporting, all outings. Near Annecy lake(22km) and Bourget lake(45km). Nearly Albertville town(olympic site), Annecy, Chamonix Mont-Blanc. Discovery medieval city of "Conflans", fortress "Battery". Cyclable away between Ugine/Annecy(40km), very easy with children. Bathing in Annecy, Bourget lakes. 3 bicycles available: 1 chid & 1 man all ground, 1 woman dirt road.